Martinez had published numerous articles questioning widespread corruption in the administration of the late Joaquin Balaguer, in his column for newspaper El Nacional. As is the case every year, the ceremony will be held at Juan Pablo Duarte Square, located at the corner of 170th Street and Broadway in upper Manhattan. An immigrant from the Dominican Republic who has quietly run a Bronx liquor store for the last few years has been charged with carrying out a politically motivated killing of a journalist in his native country 23 years ago, federal authorities said yesterday. The man, Mariano Cabrera Duran, 49, was arrested Saturday evening at his store, M & N Wines and Liquors, by federal marshals and New York police officers at the request of the Dominican authorities. 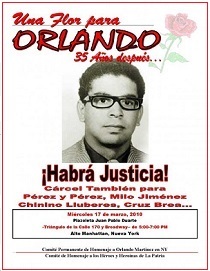 According to a complaint filed in United States District Court on Saturday, the Dominican authorities say Mr. Cabrera was ”one of the persons that shot and killed” Luis Orlando Martinez Howley outside a university in Santo Domingo on March 17, 1975.